After the first arrivals of the Dutch cucumbers, the first Dutch aubergines have been arrived as well at VGI! Currently available in the sizes 100+ and 175+. Packed in 5kg. cartons. New crop French baby potatoes (Grenaille) available! Packed in 10kg cartons. 100 cartons per plt. Fresh arrival at VGI: Dutch fresh garlic!! Packed in the recognizable 5kg cartons. Available in the sizes 50/70 and 60/80. Now at VGI: special (and very hot!) Dutch chili peppers. Available are e.g. : Naga Jolokia, Trinidad Scorpion, Cherry Bomb and Shishito. Available in several packages. Beautiful fresh garlic from Holland for sale at VGI. Available in two sizes (50/70 & 60/80) and packed in 5 kilogram cartons. Highly recommended!! From week 23 for sale: delicious figs from Israel! Available in cartons in the sizes 16 (picture), 18, 20 and 24. Season of New Zealand kiwi's will start in week 20. Due to the weather conditions, especially bigger sizes are available. 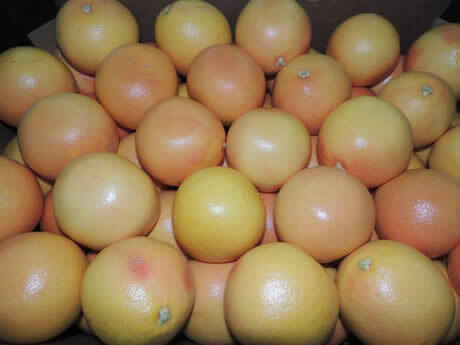 Now for sale: Grapefruits from South Africa. Available in several sizes. Packed in 15 kg cartons.